Established in 1978, UOB Bullion and Futures Ltd (UOBBF) is a premier clearing broker in the Asia/Pacific region. The firm is a wholly owned subsidiary of United Overseas Bank Limited (UOB), a leading bank in Asia, which has a global network of more than 500 offices in 19 countries and territories in the Asia/Pacific, Western Europe and North America. As the brokerage arm of UOB, UOBBF provides trading access for a comprehensive suite of products including leveraged foreign exchange, bullions, OTC derivatives, futures, options and commodities on major exchanges around the world. Their clients include retail, high-net-worth, corporate and institutional investors as well as proprietary, hedge fund and high-frequency traders. TT CEO Rick Lane (L) and UOBBF CEO Matthew Png (R) at UOBBF’s headquarters in Singapore. UOBBF has been using Trading Technologies software and distributing it to their customers in the region for more than seven years. I recently visited UOBBF’s headquarters in Singapore and had the opportunity to spend time with CEO Matthew Png. Matthew graciously sat down with me to discuss the firm’s recent expansion and partnership with TT. Rick: Where has UOB grown recently and what opportunity areas do you see for continued growth? What challenges do you foresee? 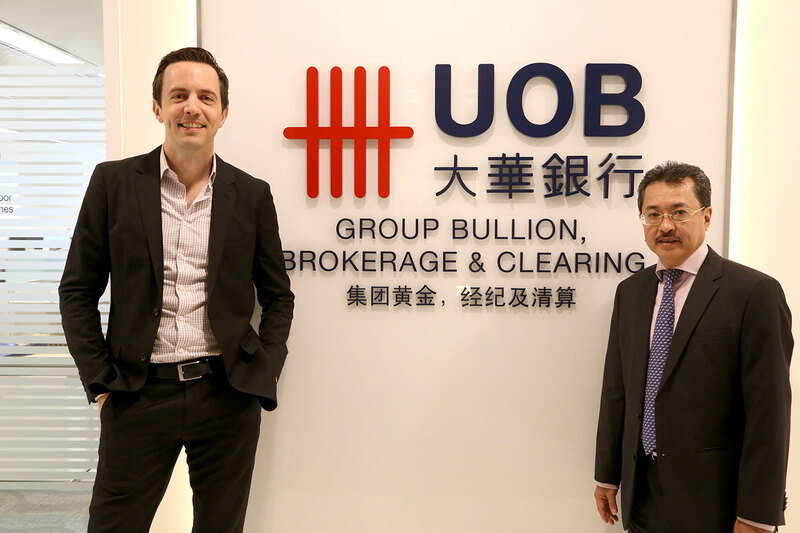 Matthew: Over the years, UOB has evolved from a local broker serving the community to a clearing broker servicing the Asia/Pacific region and beyond, offering trading and clearing services for global markets. In fact, UOBBF is also the only Singapore brokerage firm to be named the Singapore Exchange (SGX) Top Volume Derivatives Trading Member from 2012 to 2014. To continue being the Asian broker of choice for our clients, UOB was the first in Asia to obtain a General Clearing Membership from Eurex Clearing. This allows us to offer clearing services for transactions conducted on the Eurex Exchange, Europe’s largest derivatives exchange, as well as in Bund, Bobl and Schatz German government bond futures. We also recently acquired clearing memberships from CME Group, Dubai Gold and Commodities Exchange (DGCX) and ICE Futures Singapore. With our strong regional network, we are well-positioned to be the trading gateway between Asia and the world. Our 24-hour trading access capability also enables us to provide timely and reliable clearing services for transactions conducted on Western exchanges during their regular business hours. Rick: How has the partnership between UOB and TT benefitted your customers? Matthew: Our partnership with Trading Technologies has been a fruitful one. TT’s software provides us with fast and direct access to global derivatives markets. This enables us to better cater to our clients’ trading needs by offering them the tools and software to access the global markets. That TT has a strong physical presence in Asia with offices in Pune, Singapore, Hong Kong, Tokyo and Sydney makes it easier for us to service clients together. Rick: In the U.S., there has been a steady consolidation of futures commission merchants (FCMs). Has there been similar consolidation in Asia? Matthew: Yes, FCM consolidation is happening in Asia too. In the face of stringent regulations as well as capital requirements, it is advantageous for FCMs to consolidate in order to better comply with the regulations and improve their cost-income ratio. Rick: As an FCM providing access into various regulatory environments, how do you manage the different structures and rules so that the traders–your customers–can focus on trading? UOBBF CEO Matthew Png (R) talks with TT CEO Rick Lane (L). Matthew: At UOB, serving our clients’ needs is our top priority. This includes complying with regulations across the markets that we operate in and ensuring that the trading activities that we carry out for our clients are in line with those regulations. Rick: With increasing trading volumes and growing regulations, where are you making infrastructure investments in order to meet the new requirements related to data storage or faster settlements? Matthew: We have been making steady strides in enhancing our connectivity to various exchange data centers in the U.S., Europe and especially across Asia/Pacific. We are also enhancing our back office system with improvements to be rolled out in phases for our risk management, trade settlement, transactions processing and other processes. Rick: In the U.S. and Europe, there has been some talk about requiring futures traders who use automated trading strategies to register with regulators. How are the Asian regulators addressing automated trading systems? Matthew: While automated trading is becoming more common in the market, it is important for traders with automated trading strategies to fully comply with various exchanges’ trading rules, since different exchanges within different jurisdictions have their own set of rules and regulations. Rick: Most U.S. traders know that the KOSPI 200 futures and options are some of the most liquid contracts in the world. What other Asian markets and contracts present attractive trading opportunities? Matthew: U.S. traders looking for opportunities within North Asia may want to consider the SGX FTSE China A50 futures. Listed on the Singapore Exchange (SGX), the trading hours for SGX FTSE China A50 extends well into European and U.S. time zones. This makes SGX FTSE China A50 a convenient instrument for U.S. market participants to respond to off-market news and to manage their exposure amid heightened volatility. For example, when the People’s Bank of China (PBOC) suddenly reduced interest rates on August 25, the SGX FTSE China A50 futures rallied sharply in response and retreated towards the close of the T+1 session. Bid and offer spreads averaged around 2.5 basis points during onshore trading hours. Rick: What is UOB Bullion and Futures doing to assist customers interested in accessing the relatively new Chinese futures markets? Matthew: We keep our customers abreast of all developments in China’s futures markets. We are constantly evaluating our clients’ demands for Chinese products and are also closely following developments at the Shanghai International Energy Exchange (INE). When launched, the INE will be the first exchange in mainland China to offer the trading of domestic futures contracts by overseas participants. With the establishment of our wholly foreign-owned enterprise (WFOE) in Shanghai and our satellite office in Hong Kong, we are ready to seize any opportunities arising from North Asia. Rick: UOB has recently become a remote clearing member for Eurex and CME. Which other exchanges are you considering? Matthew: We recently attained a clearing and trading membership on ICE Futures Singapore as one of their first three clearing members. The platform will be launched in the last quarter of 2015. Three new contracts are scheduled to be launched initially by the exchange, namely the mini Brent, One-Kilo Gold and Chinese Renminbi futures. These new products will provide hedging opportunities across financial and commodity derivatives for market participants to manage risk in a regulated and transparent market. And as mentioned earlier, we are also closely following the developments of INE in Shanghai. Rick: The Hong Kong Connect link was launched this year. How does UOB Bullion and Futures see this transforming the industry in the region? Matthew: The launch of the Hong Kong Connect link has been met with strong interest as it offers investors another official conduit to take part in the rapid growth of China’s equity markets. The Chinese authorities have announced that they are considering a similar scheme for the commodities markets as an initial step to open their doors to foreign investors. We see that the pace of market liberalization is picking up, and we look forward to having the Chinese market become more integrated with the global markets. Rick: What is next for UOB Bullion and Futures in the foreseeable future? Matthew: UOBBF will continue to capitalize on our strengths in the Asia/Pacific region to retain our position as the premier clearing broker in the region. In order to do so, we will continue to invest in infrastructure and technology, and we will engage the Asian trading community to support their trading needs.